Our annual Seconds Sale is coming up and we need your help! Please consider donating your seconds, newspapers, paper bags, and your time. We would greatly appreciate donations of seconds! Seconds are any ceramic pieces (pots, sculptures, tiles, etc.) that are not quite perfect, but still in need of loving homes. 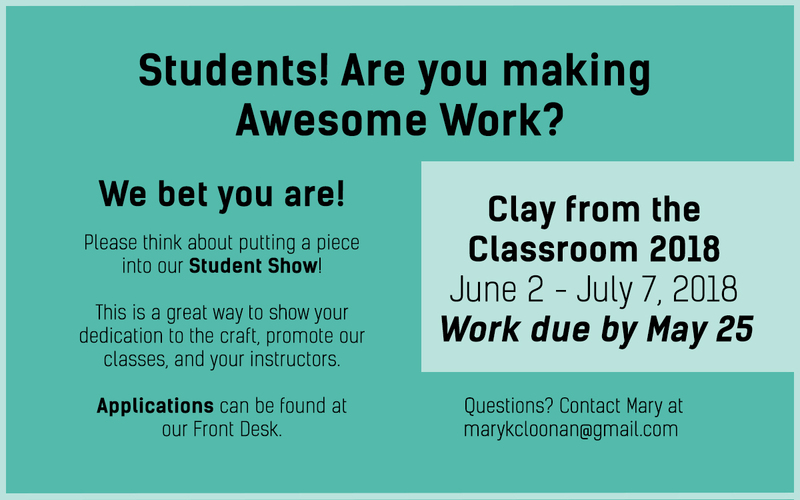 Donations will be sold at discounted prices, and all proceeds will benefit Baltimore Clayworks’ educational and artistic programming in Mount Washington and throughout the Baltimore. Please leave your donations in the front entry to the Studio building, under the mural. If you are interested in volunteering to help with the sale, please contact Mary at marykcloonan@gmail.com. Wednesday, May 30th: Set-up from 10am - 4pm. Thursday, May 31st: Set-up from 10am - 4pm. Friday, June 1st: Set-up from 10am - 4pm. Spice It Up! Preview Party from 5pm - 10pm. Saturday, June 2nd: Seconds Sale from 12pm - 5pm.